Wake your class up with this engaging and entertaining formative assessment. With a little preparation and careful instructions, students can rotate through several novel based activities with simply a “rotate” from the teacher every 9-10 minutes. 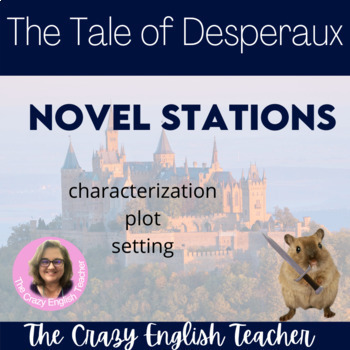 You get 9 literacy stations based on The Tale of Despereaux. The stations include engaging lessons about characterization, plot, theme,symbolism,novel mapping, and comparison and contrast. Using stations with students creates interest and adds engagement to any lesson. A student that was previously listless will sit up and take notice when asked to work as a team to accomplish several tasks in a timely manner. The stations are fast moving and usually produce a product. Upper level students enjoy the fast pace and high interest of station work. This activity takes a little planning, but when in process the educational component becomes a student driven learning experience. Learning stations require a little preparation. Read the station instructions for the necessary supplies: markers, construction paper, computer paper, scissors, glue sticks,or tape. Each one varies. If a station requires extra items I will note it with an asterisk at the bottom of the page.